For Pennsylvania and for the country; small companies are big business, and the importance of small businesses to the American economy and our local communities has long been known. Since 1963, the president has marked National Small Business Week each year to recognize the contributions of small firms to the economy. Since 1978 Bucknell’s Small Business Development Center has been providing entrepreneurs and business owners in six counties with educational programs and no-fee consulting services through a partnership with the U.S. Small Business Administration (SBA) and Pennsylvania’s Department of Community and Economic Development. But now more than ever; the energy and diversity fueling entrepreneurial endeavors in the valley is enabling firms to launch with greater facility, to dream bigger, and to have a greater impact in the world than ever before. In the last year alone, more than 40 entrepreneurs achieved their dream of starting their own business with the help of Bucknell’s SBDC. The positive innovations and jobs being created by these growing firms will drive the economy of the 21st century. Knowing that two out of every three private sector jobs are created by small firms is strong impetus to provide entrepreneurs with resources to help them succeed. Take Michael Levan, founder of Novipod, for example. In just two years, his firm has grown from a nascent startup to a nationwide Verizon Wireless Preferred Partner providing industry-leading critical-care transplant services with their innovative OrganTracker technology. Located in StartupLewisburg, Bucknell’s home for innovators; Novipod accelerated its growth by embedding itself in the university’s entrepreneurial ecosystem, where they have found spirited collaborations with faculty, students, and the SBDC. Another example lies in Mary Tiffin, inventor of RunLites, gloves with built-in high-power LED lights. Launching her product from the same incubator as Novipod, Mary recently garnered great acclaim while exhibiting at the Boston Marathon; and the RunLites debut this year was buoyed by the endorsement of Kevin Harrington, one of the original “sharks” on Shark Tank. Even retailers are having a highly positive impact in the world far beyond their downtown storefronts. With every product Kaitlin Shuck selects for the shelves at Threading Love in Lewisburg, she shares the story of how the artist, designer, or brand behind it is striving to cease global injustices. By blending modern responsible sourcing practices with the power of storytelling she champions fashion as a force for social justice. Her signature fashion collection is handmade by survivors of trafficking in Cambodia; where the full time jobs, healthcare, and education they now enjoy is helping them rise out of poverty. Michael, Mary, and Kaitlin lead three of the almost 1 million small businesses across the commonwealth; firms that employ almost half of Pennsylvania’s workforce. Almost all of the firms in the state with employees are small, and these firms comprise over 98 percent of all employers in the state. If the output of the country’s 28 million small businesses was compared to the economies of other nations, it would outrank Germany and Japan, and be the world’s third most productive economy. In service to these and countless others entrepreneurs; the SBDC is proud to mark National Small Business Week by presenting a series of educational programs and celebratory events. We are pleased that State Representative Lynda Schlegel Culver opens the week on May 2 at her Sunbury office by hosting the SBDC for consultations with business owners. Events throughout the rest of the week include workshops on marketing strategy on May 3; engaging customers via email, social media, and mobile devices on May 4, and web sales and online advertising on May 5. The week concludes on May 6 with a special presentation of the SBA’s Excellence and Innovation Award to the Bucknell SBDC. 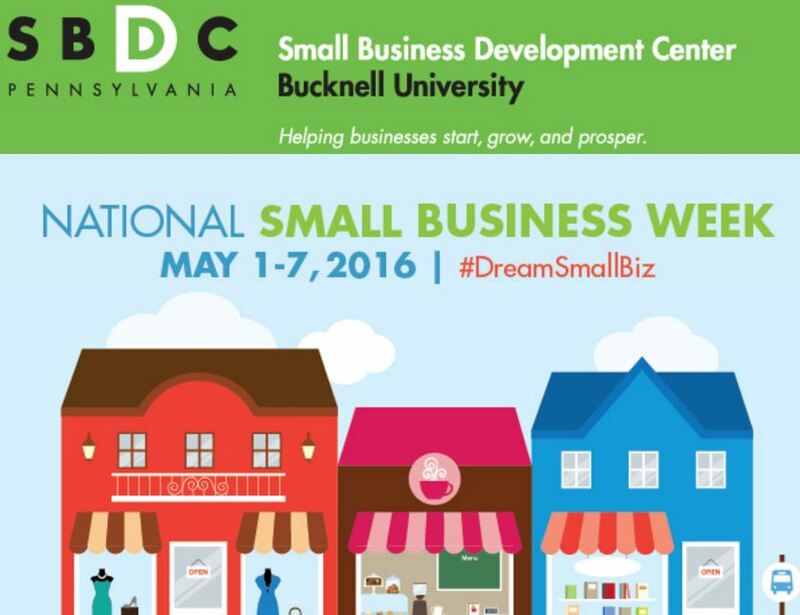 To learn more about National Small Business Week visit www.Bucknell.edu/SBDC. The text of this blog originally appeared as an op-ed in the Daily Item to launch National Small Business Week on May 1, 2016.